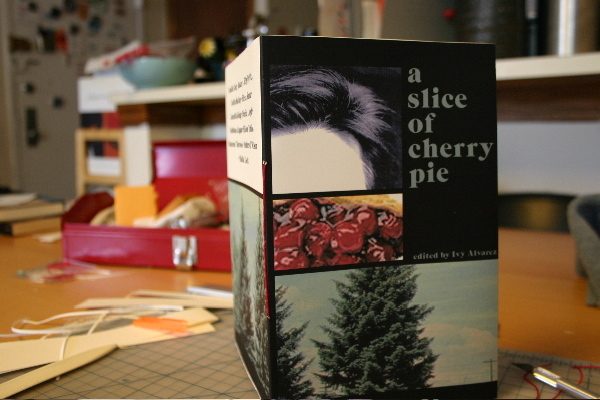 A Slice of Cherry Pie, edited by Ivy Alvarez. From the HE/HF archives. Bloof will open the month of June for manuscript submissions of poetry chapbooks. All manuscripts must adhere to the requirements below, and be submitted electronically between June 1 and June 30, 2012. We will choose at least ONE but as many as SIX chapbooks to publish between Fall 2012 and Fall 2013. If your chapbook is chosen, you will hear from us via email. If not, you will be notified of the selections when we make the public announcement, on or around September 1. 3. Manuscripts should be typed, in English, consist of up to 30 pages of poetry, and be formatted in a sane, easy-to-read manner. The work should be unpublished in chapbook or book form, as a whole, though individual poems may have appeared in magazines, etc. 4. Collaborations and translations are acceptable, with the participation of all collaborators. If you are submitting translations, you must include written permission from the original poet (or copyright holder). 10. Any submissions that do not follow these guidelines will be automatically deleted. It’s fine to ask a question (same email address) if something is unclear, but if we can tell you haven’t read what we’ve taken the time to write here, we probably won’t answer. We’re very busy...and about to get a whole lot busier.